So I just came back from an advanced screening of Gravity, starring Sandra Bullock and George Clooney. Before I knew what this movie was about, I thought that this was going to be some sort of romantic comedy, simply because of the cast. Show how quick I am to judge. 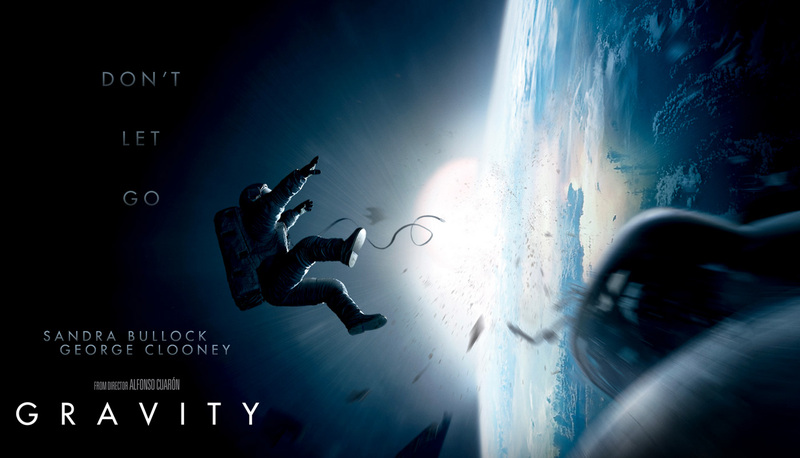 Gravity focuses on Sandra Bullock’s character, Ryan Stone, who is a medical engineer sent to space for the first time. She is accompanied by two other astronauts, one of which is George Clooney’s character: Matt Kowalsky. As she’s fixing something during a spacewalk, they get notice that Russians crashed a satellite, leading to a chain reaction of other satellites and structures to be destroyed from the debris. They had to get out of there. Quick. Of course, not everything goes according to plan. We see Dr. Stone left adrift in the vast emptiness that is space. She starts to panic, but soon enough, Matt comes to her rescue and tethers her to him. Together, they try to return to their space vessel. This is only one of the first problems to come their way as they desperately try to find a way for them to return to earth. I watched the whole thing feeling like I was going to have a heart attack at every scene. It was very stressful, but that’s not to say it was at all bad. If I had to name a movie you had to watch in 3D, this would most likely be it. Zero gravity and 3D works amazingly well together. Asides from visuals and acting, the story itself made you ponder on how small you are. You are so insignificant, especially when compared to the huge unknown void that is space. What is the point? We see Sandra Bullock’s character going through the same process, and well, I guess you’ll have to see how it ends for her. Gravity comes out October 4th! If you’re okay with watching something pretty heavy, go watch it. Be prepared though! It’s a beautiful movie, with suspense around every corner. Are you like on the vip list of advanced movie screenings? I’ll look out for this if a friend suggests a film. I wouldn’t usually go for something with Sandra Bullock in it – as you say her presence reminds me of romantic comedy. Haha! Yeah, I think of “The Proposal” and “Miss Congeniality”, and I just wrote her off. But this was quite a change. Be prepared (if you do go) because it really is a very tense movie! Like a roller coaster ride. I’m the sort of person to close my eyes if it gets really bad. Amazing how movies can draw us in to lives that aren’t real. Haha yeah, I didn’t expect one of her movies to be so intense. It is good 🙂 Stunning visuals too! I WATCHED HUNGER GAMES. No spoilers but I did manage to soak up 4 napkins (which i stole from their concession area) with my tears. Gravity has to be watched in theatres. Seriously. If your cousin’s not willing to go, go alone. I mean, yeah, even if you end up thinking it wasn’t good, you gotta give it props for how it was filmed and how perfect it was for 3D. When I watched Hunger Games yesterday, I kept wondering which scenes were worth my tears but I couldn’t find one. Like not even close. Hahaha. I wanted a real ending, doggone it! I watched Gravity today. Ya it was pretty good. It was so obvious that some of those scenes were dedicated to Sandra Bullock’s legs. There were only 4 people in the theatre! A whole row to myself…score! After leaving the Gravity theatre, I was going to leave and then got the bright idea to just walk into another show..haha. I watched Homefront. It wasn’t boring but I think it’s more of a satisfying rental. Ahaha! I cannot imagine watching Gravity not in theatres. You’d just be watching some woman float through space (I guess it’s deeper than that); whereas in theatres you actually live a bit of that floating. Ahh I guess Hunger Games for you was like the Hobbit for my sister. She finished it and was like “Wait? Was that the end? What?” Still got one book left for the Hunger games 😛 Mockingjay is good… in a way.